It was mixed fortunes for Chinese Taipei in the singles in the USD775,000 Danisa Denmark Open which ended on Sunday as Asians ruled in Odense. 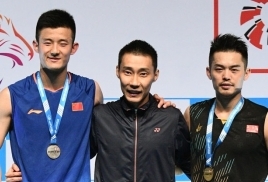 The fact that Asian shuttlers walked away with all the five titles at stake is a clear sign that Asia is still the world badminton powerhouse with Japan leading the charge with two titles. Japan's Kento Momota showed why he is the current world number one when he handed Chou Tien Chen of Chinese Taipei a 22-20, 16-21, 21-15 defeat in a 77-minute match to win his first Denmark Open. The win ended a 48-year wait for Japan to win the men's singles title after Ippei Kojima won it in 1970. 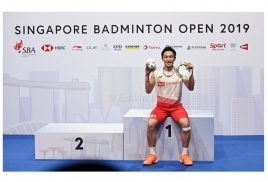 It was an epic 77-minute battle between two of the hardest hitting shuttlers but world champion Momota managed to bring out the "extra" in his game to subdue his opponent for the title. Where Tien Chen failed for Chinese Taipei compatriot Tai Tzu-ying made things count in the women's singles final - also coming through a three-game battle against India's Commonwealth Games champion Saina Nehwal, prevailing 21-13, 13-21, 21-6 in 52 minutes. Tzu-ying, the top seed and ranked number one, used her superior fitness to stop the soon to wed Nehwal but admitted once again that her rivals are "catching up" and have studied her game. Japan added a second title in Odense through their women's doubles. In an all-Japan final top seeds Yuki Fukushima-Sayaka Hirota won in a straight games 21-19, 21-16 against fifth seeds Shiho Tanaka-Koharu Yonemoto. Indonesia's top-ranked Marcus Fernaldi Gideon-Kevin Sanjaya Sukamuljo, as expected, walked away with the men's doubles title with a dominant 21-15, 21-16 win against Japan's Takeshi Kamura-Keigo Sonoda in 36 minutes. China's Zheng Siwei-Huang Yaqiong had no problem in the mixed doubles, winning easily 21-16, 21-13 against Thailand's Dechapol Puavaranukroh-Sapsiree Taerattanachai in only 34 minutes. Such was the dominance of the Asians that it was a whitewash for Europe with none of the Europeans even reaching the finals of any event. Top seed Viktor Axelsen lost to compatriot Anders Antonen in the quarter-finals. Tien-chen beat Antonsen in the semi-finals while England's Marcus Ellis-Chris Langridge lost to Kamura-Sonoda in the last four in the men's doubles.